We talk with you, not at you. Our initial consultation is about meaningful dialogue regarding your wants, needs and lifestyle. By having a quality exchange we develop design solutions that work for you, the architecture and the space at hand. Our philosophy follows that of Thomas Church who wrote, "Gardens Are For People". We apply this philosophy with enthusiasm during the concept, design and installation stages of all our projects to ensure they conclude successfully. Chicago Specialty Gardens (CSG) celebrates 24 years of designing and installing Chicago gardens in 2019. CSG is an award-winning, full-service urban garden design/build firm headquartered in Chicago, Illinois. We are specialists in the design, construction and installation of urban gardens. Our design approach envisions the transformation of entire spaces, and we employ a multi-disciplinary design team to turn our vision into reality. CSG was founded by Phil Cleland in 1993 as a part-time business designing and installing Chicago gardens, but by 1995 the company had grown and was incorporated. In the intervening years much has been learned, and many people deserve credit for bringing CSG to its present incarnation. We have worked hard, had great clients and been fortunate. Our company vision is to be the premier full-service urban garden design/build firm in Chicago, and to operate with integrity and respect toward our employees, clients, suppliers and the natural environment. We employ specialists in numerous disciplines to bring together our creative visions, and we bring both an artistic and functional interpretation to our garden spaces. Chicago is a fantastic city to work within. Our installations of rooftop gardens in recent years, in particular, gives us a renewed appreciation for our city’s skyline, our sun and air, our weather, and the infinite possibilities for creating gardens and living spaces above the city. We continually are expanding our knowledge base about rooftops, and CSG offers all the services and requirements for a rooftop garden — from structural analysis, to city permit generation, to design, construction, planting and lighting, and finally to the finishing out of the rooftop décor. Feel free to reach out to us, we would love to hear from you! Our 59 years of success comes from our dedication to building long-term relationships with our clients. Whether a landscape design project or landscape maintenance plan, we set out to make every client, a client for life. The majority of our clients come from referrals. Schmechtig Landscapes is an award winning full service firm who provides: landscape and garden maintenance, design work to include hardscapes design and construction: brick and stone patios, outdoor kitchens, fireplaces, firepits, driveways, walkways; landscape and lawn maintenance including fertilization; container pot service, plant bed design and irrigation and outdoor lighting service and outdoor furniture design service. Our philosophy is to treat the landscape of our client’s property as if it is our own. We give our clients the convenience of working with one company for all their landscape needs giving them the gift of time to spend with family and friends. This approach has remained since the start of the company in 1960. Our staff includes Registered Landscape Architects and Designers, Certified Landscape Professionals, Certified Landscape Technicians, Licensed Plant Health Care and Pesticide Technicians. Schmechtig Landscapes creates and maintains living environments that bring people together and we are very proud of the long term relationships we have nurtured. Give us a call to discuss your needs. We would love to hear from you! Calafia Design LLC was started in 2003 by Katy Sheppard. It is a culmination of years of education and experience in planting, hardscape, art and design that informs a sense of space, layout, color and construction. The designs are grounded in pragmatism, so that your garden is an intuitive extension of you. Katy, a native Californian, earned her BA from University of California, San Diego. She first entered the green industries in her mid-20’s, spending several years as a landscaper, then carpenter for a landscape architecture firm. She pursued further studies in drafting, design, painting (both figurative and abstract), and finally, a two-year certificate in Ornamental Horticulture at the Regenstein School at the Chicago Botanic Garden. 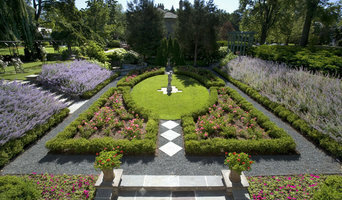 She is a member of the Association of Professional Landscape Designers. Although Calafia Design is a solo operation, Katy employs the expertise of some of the North Shore’s top landscape installation firms to provide every phase of your landscape project from concept to realization. DuPage County - Best of Houzz Service & Design Award Winner 2014-2018! For almost 40 years Harvey has been designing and installing residential landscape. The president of Apple Blossom Landscape, Harvey, will be your designer and contact person. We are know for our creative designs, broad knowledge of both landscape and hardscape engineering, attention to detail and our customer service. We can handle all of your outdoor landscape needs including but not limited to, design, planting, landscape lighting, pergolas, drainage solutions, retaining walls, patios, walks and driveways, etc. Your project cost is determined by the size of the job. We are family owned and operated, Apple Blossom Landscape Concepts is a company that was founded on the idea that we will conduct business in excellence; in a professional, ethical, and honest method. We do that by treating our clients with complete respect. We make their needs a priority, standing behind our promises and guarantees. We are a fully insured, family owned company that takes pride in not only providing our clients with an excellent service, but also ensuring the best value for their landscape dollar. Apple Blossom Landscape can offer a client 35 years of experience in the trade. We have industry exclusive warrantees, and go well beyond the norm in standing behind them. Whatever you have in mind, our devoted landscape architects and designers have the talent, experience and passion to create it just how you envision. For over 30 years, our Rolling Landscapes team has been working together enriching the lives of our clients. We believe our love and passion for this business is every bit as important as our landscape design skills. After all, you must first care enough to take the time to listen and ‘get’ a homeowner’s vision before you can possibly bring it to life. This customer-centered philosophy has been at the core of our business model for over a quarter of a century now. It’s helped us win prestigious awards. More importantly, it’s helped us win a devoted following. No wonder so much of our new business comes from repeat customers and their referrals. To see how our caring and talented team of landscape professionals can help you realize your own vision, we invite you now to view our work below. 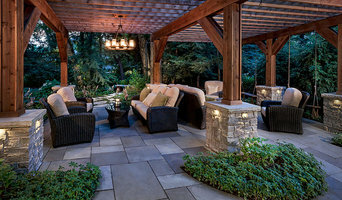 Chicagoland's Landscape Design and Build Company - Best of Houzz! Nathan’s approach to design merges the classic principles of harmony, scale, and hierarchy with a more contemporary focus on function and efficiency. Nathan creates inspired places for outdoor living - landscape rooms that are fitted to your family, sustainable designs that reuse rainwater, and planting combinations that seem to care for themselves. Our design & build projects are as unique as the clients we serve. All projects begin by understanding your vision for outdoor living and determining the distinguishing features of your site. We then leverage these opportunities to fulfill your vision using our aesthetic discernment, knowledge of landscape materials, and construction experience. Ross and Jack's Landscaping Inc. Since its inception in 1975, Ross and Jack’s Landscaping Inc. has strived to provide the Chicagoland area with the utmost in landscaping Services. For over 40 years we have remained a family owned business that specializes in Landscape Design and Installation, as well as, Grounds Maintenance and Lawn Care. We pride ourselves on being a professional landscape company with the capability to handle a multitude of projects, while all the while giving you the personalized service and attention you deserve. With our experience, you can be sure we will get your job done correctly, on time, and at an affordable price. Please contact us today to schedule an appointment with us. We offer free, no obligation consultations. *Authorized Dealer of RH Peterson Products* CGD WINNERS OF BEST OF HOUZZ 2013-18 Chicago Green Design (CGD) has built its reputation as the leading entertainment rooftop Design/Build company in the United States. Our Team of designers on average have over 26 years of experience in the landscape and rooftop garden design business. Having the honor of not only being one of the oldest designated rooftop design companies in Chicago but in the country. With accolades across our Nation. We continually work with partners worldwide collaborating and enhancing rooftop product specifically. This allows us to always be on the cutting edge of technology. Keeping current allows us to offer you the best the industry has to offer. CGD Inc is a designated High end Engineering Design/build firm for the most elaborate rooftops in the world. 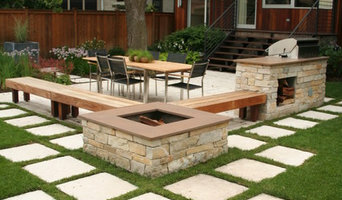 We are a fully integrated landscape design and construction business, serving Chicago and suburbs for 25 years. From the initial design stages to final construction, we remain your one source, ensuring quality and craftsmanship throughout. Our services include fine masonry, patios, walkways, fireplace and firepits, water features, ponds and fountains, pergolas, custom decks, tree and shrub installation, perennial, native, and edible gardens, and landscape lighting. Our Goal Is Your Satisfaction. Your dream of having a beautiful landscape can become a reality with a professional, knowledgeable landscape contractor. CMS works with you to incorporate your ideas, needs and desires into designs that are functional, healthy and beautiful. We combine well thought out hardscapes with the right plants for the right locations. This promotes good plant health and lower maintenance, while ensuring that the design compliments your home and personality. We work with our customers to build living spaces that will bring family and friends together. These are the places where you create memories that last a lifetime. CMS knows that great landscaping isn't just about aesthetics and a quality finished product, it is also about economics. CMS works with you, within a budget that is comfortable for you. You're not just beautifying your home, you're making an investment in it. The work of this outdoor professional includes most everything surrounding a home's exterior. A landscaping architect can even work with the home architect to choose the right spot for your Westmont, IL house. From there the Westmont landscaper will develop preliminary concepts for your front or backyard design based on individual needs including the climate and activities that will take place, as well as layouts and planting plans. Landscape architects will also design any structures or outbuildings that will be added to the space. Any grading changes that will be added to the yard are also the responsibility of the architect. This includes any drainage modifications. An engineer can also be responsible for these tasks, but licensed Illinois landscapers are fully capable. Like building architects, they will produce preliminary concept drawings as well as detailed construction documents and planting plans. Three-dimensional renderings and illustrative plans are all supplementary. A Westmont landscaping designer generally will have ecological, aesthetic and technical training, which helps them maximize the potential of your outdoor space. Keeping in mind both style and functionality, garden designers analyze your architecture and yard to produce a plan that may or may not include location and materials for walkways, patios, water features, fences, garden aspects and more. In addition, a landscaper in Westmont, IL will carefully assess your geographic region to choose plants, trees and flowers that will flourish naturally, as well as address concerns such as drainage, screening and soil conditions. Certain landscape designers only help with the planning portion, while some may deliver the plans and then oversee a hired landscaping contractor. Others — typically following a design-build approach — take care of both the design and all aspects of the landscape architecture and construction. Before you hire an Illinois professional landscaper, consider the scope and emphasis of your outdoor project. Landscape architects, who typically hold advanced degrees in their field, are trained to develop comprehensive structural plans that include plants, hardscaping, water use, drainage and more. Landscape designers typically specialize in the aesthetic and horticultural, rather than structural, side of yard and garden planning. They might or might not have advanced training. Even within their fields, a garden designer may specialize in hardscape- or vegetation-focused designs. 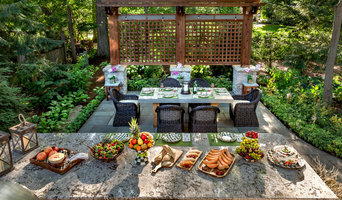 In some cases you might need to hire additional help to get the outdoor space you want. Here are some related professionals and vendors to complement the work of landscape architects & landscape designers: Landscape Contractors, Garden & Landscape Supplies, Tree Services, Gardeners, Lawn Care & Sprinklers, Decks, Patios & Outdoor Enclosures. Find a Westmont landscape architect on Houzz. 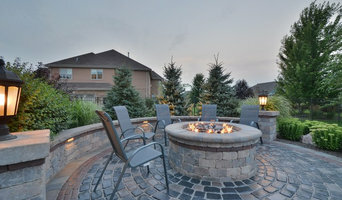 Narrow your search in the Professionals section of the website to Westmont, IL landscape architects and designers. You can also look through Westmont, IL photos to find a space you like, then contact the professional who posted the photo.